Are You struggling with weight gain issues or you’re suffering from nutritional ailments? Have you ever heard the buzz in regards to the Mediterranean Diet? Probably, yes; but then, you jerked off from asking or learning what it is all about. Do not snap and fret out of it any longer; this book is an easy introduction to a heart-healthy way of enjoying your meals. Contrary to other famous diets loaded with sodium, fat, and sugar, the book shows you what a healthy meal comprises. In too many circumstances, the word diet is associated with negativity, as opposed to its original meaning as you will find out. Presumably, you know the word to express limitation, and in our case, limited food. In the event that one adds weight, there is a pathological theory that you have accumulated fats in your body. It could be true, and if it were true, you get statements that you should diet. However, this is not so with the Mediterranean diet. So, the golden question is; what is the aim of this book? This book aims to describe a dietary pattern that is typically prescribed by researches that approve it as one of the healthiest method of eating. Safe food doesn’t always mean boring and tasteless, now there’s a healthy new edge of recipes and flavors that are both addictive, easy to make, and weight friendly. Further, the book contains a seven-day meal plan which is an excellent appetizer for beginners. Also, it has an exquisite collection of recipes that will help you prepare a bevy of sumptuous dishes that will leave you full while still infusing critical nutrients to your body. 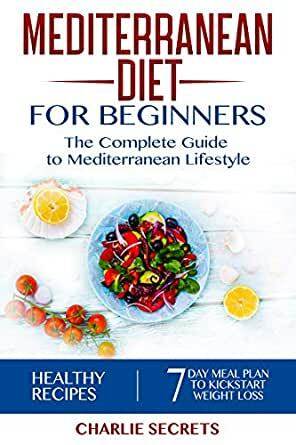 Mediterranean Diet for Beginner is a complete guide that accommodates all age groups and therefore is readily available and convenient for anyone. Scroll to the top of the page and select the buy now button to start living the Mediterranean Lifestyle. The heart-solid Mediterranean eating regimen is a good dieting arrangement dependent on run of the mill nourishments and formulas of Mediterranean-style cooking. Here's the way to embrace the Mediterranean eating routine. The Mediterranean eating regimen is likewise connected with a decreased occurrence of malignant growth, and Parkinson's and Alzheimer's maladies. Ladies who eat a Mediterranean eating regimen enhanced with additional virgin olive oil and blended nuts may have a decreased danger of bosom malignant growth. The Mediterranean eating routine disheartens immersed fats and hydrogenated oils (trans fats), the two of which add to coronary illness. The Mediterranean eating routine is a delectable and sound approach to eat. Numerous individuals who change to this style of eating state they'll never eat some other way. Here are some particular strides to kick you off: If you don't drink liquor, you don't have to begin. Drinking purple grape juice might be a choice to wine. This book gave me a great deal of information.This book is amazing to peruse and I think this book is the best book of this point, and I truly welcome this book. 5.0 out of 5 starsAmazing book. Fantastic Writer. Recently I’ve purchased a new electric pressure cooker and I’ve been looking for a good source to know how to get the most out from my instant pot pressure cooker. By hearing my interested, my elder cousin highly recommend this cookbook and upon hearing from her, I didn’t wait or feel hesitate to purchase this book. Its price was affordable and throughout this book, I have learned dozens of easy, simple and delicious recipes. The most excellent thing about this book, is all these recipes are based on Mediterranean diet. So my friends, if you’re currently following Mediterranean diet and want to learn some relevant recipes for your diet, even for your pressure cooker to cook them every day, then never miss your chance to get ideas from this cookbook. I’m so happy with my purchase and the recipes I’ve learned from here. Though still I didn’t yet try any item but looking forward to try these recipes from this weekend. Easy enough my hubby does all the cooking now. Yes, he does but only because I am too sick to stand long enough to do it. This basic Mediterranean eating routine cookbook is intended for apprentices for furnishing useful direction and formulas with appropriate eating regimen dinner arranging. This eating regimen cookbook will disobediently total your inquiry of actualizing valuable eating regimen without confronting any trouble. every one of this cookbook formulas are very much expounded. This is a science book, nutrition book, and cook book all in one; an excellent resource for your mediterranean Diet . This book has not only the "why" but also the "how" for every single aspect of your diet and therefore this is the only book you need to get started and forge ahead with confidence. The recipes are easy to follow and prepare for beginners.Thanks!